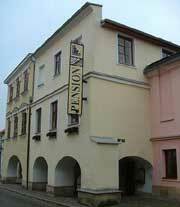 Having once made a last minute decision to spend the night in Litomyšl, without any accommodation organized, I found that the cheap rooms at the Black Eagle pub were booked out, and asked around at some of the pensions in town. 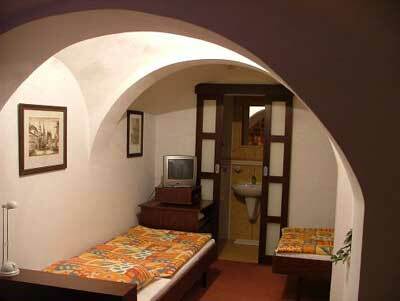 Several had single rooms for 800Kč and Pension Petra was the one I liked the most. 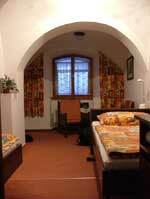 It’s a pleasant small pension located in a renovated historic house on Božena Němcová street between the monastery gardens and the main square (just across the street from the Black Eagle). The front door is kept locked, so to enter the premises you’ll need to ring the doorbell to be let in and then climb one flight of stairs to the reception desk. The check-in procedure was fast and simple and included a short description of how to use the heating in the room, which keys were for which doors and so on. I had room # 1 which is on the ground floor just to the left of the main entrance door. It’s a reasonably small room, but the space was cleverly used, and contained two single beds and two tables; one accompanied by a pair of armchairs and a lot of printed information about Litomyšl, the other with a television and satellite box. The attached bathroom was tiny, but spotlessly clean and well-stocked with soaps, shampoos and even facial tissues. Three original charcoal sketches of various Litomyšl streetscapes also hung in the room and along with the rest of the furniture and the white-painted arched ceilings it was really quite a pleasant room. I paid 800Kč for the night, which is more than I would normally like to pay, but was a discount from the normal double room rate of 1000Kč. Breakfast was also available for 100Kč, and there was a minibar in the room stocked with drinks at reasonable prices (cola 25Kč, Mineral water 10Kč). I also visited Pension pod Klášterem, which had double rooms for 800Kč, with no discount for use as a single, and Pension Paseka on the main square, where the cheapest of the three double rooms was 1200Kč. The main negative about the room at Pension Petra was the noise. The doors (there was a second at the rear of the room, which was kept locked and had furniture arranged in front of it) were thin and kept out very little of the noise made by people coming and going up and down the stairs. Even though it was a little more than I would usually like to pay, in the same circumstances I would be happy to stay there again.